When the library first opened in 1954, there were 80 applicants for the librarian position. 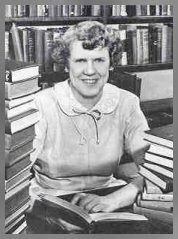 The library board selected Miss Hilda Nordvold who was a former high school teacher from Winona, Minnesota. Anna Raines of New Cumberland is the current Director of the library and is assisted by Judy Jewell, also of New Cumberland.